Righteous Simeon the God-Receiver was, according to the testimony of the holy Evangelist Luke, a just and devout man waiting for the consolation of Israel, and the Holy Spirit was upon him (Luke 2:25). God promised him that he would not die until the promised Messiah, Christ the Lord, came into the world. Ancient historians tell us that the Egyptian pharaoh Ptolemy II Philadelphus (285-247 B.C.) wished to include texts of Holy Scripture in the famous Library at Alexandria. He invited scholars from Jerusalem, and the Sanhedrin sent their wise men. The Righteous Simeon was one of the seventy scholars who came to Alexandria to translate the Holy Scriptures into Greek. The completed work was called "The Septuagint," and is the version of the Old Testament used by the Orthodox Church. St Simeon was translating a book of the Prophet Isaiah, and read the words: "Behold, a virgin shall conceive in the womb, and shall bring forth a Son" (Is 7:14). He thought that "virgin" was inaccurate, and he wanted to correct the text to read "woman." At that moment an angel appeared to him and held back his hand saying, "You shall see these words fulfilled. You shall not die until you behold Christ the Lord born of a pure and spotless Virgin." From this day, St Simeon lived in expectation of the Promised Messiah. One day, the righteous Elder received a revelation from the Holy Spirit, and came to the Temple. 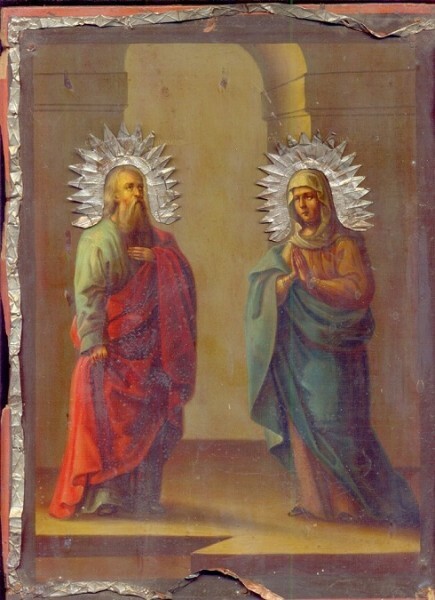 It was on the very day (the fortieth after the Birth of Christ) when the All-Pure Virgin Mary and St Joseph had come to the Temple in order to perform the ritual prescribed by Jewish Law. When St Simeon beheld their arrival, the Holy Spirit revealed to him that the divine Child held by the All-Pure Virgin Mary was the Promised Messiah, the Savior of the world. The Elder took the Child in his arms and said, "Lord, now lettest Thou Thy servant depart in peace, according to Thy word, for mine eyes have seen Thy salvation, which Thou hast prepared before the face of all people, a light to enlighten the Gentiles, and the glory of Thy people Israel" (Luke 2:29-32). There is a Christian epigram (Number 46) in "The Greek Anthology" which is addressed to St Simeon. It tells the righteous Elder to receive the Child Who was born before Adam, and Who will deliver Simeon from this life and bring him to eternal life. A similar idea is expressed in the Aposticha (Slavic use) for the Forefeast of the Nativity of the Lord (December 24). There the Mother of God refers to her Son as "older than ancient Adam." 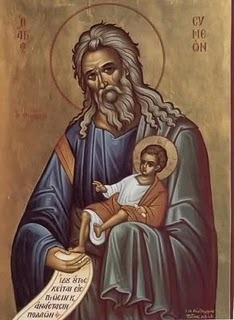 Simeon blessed the All-Pure Virgin and St Joseph, and turning to the Mother of God he said, "Behold, this child is set for the fall and rising again of many in Israel, and for a sign which shall be spoken against. Yea, a sword shall pierce through your own soul also, that the thoughts of many hearts may be revealed" (Luke 2:34-35). The holy Evangelist continues: "And there was one Anna, a prophetess, the daughter of Phanuel of the tribe of Aser. She was of a great age, and had lived with a husband for seven years from her virginity; and she was a widow of about eighty-four years, who did not leave the temple, but served God with fastings and prayers night and day. And coming at that very hour, also gave thanks to the Lord, and spoke of Him to all those who looked for redemption at Jerusalem" (Luke 2:36-38). The holy righteous Simeon the God-Receiver died at a great age (Tradition says he was 360). His holy relics were transferred to Constantinople in the sixth century. His grave was seen by the Russian pilgrim St Anthony, the future Archbishop of Novgorod (October 8) in 1200.
receiving into his arms the Eternal God as an infant. which You have prepared for all the nations to see!" Simeon the Righteous and Anna the Prophetess, well-pleasing to God.